After the sad sad shade story. The whole reason that I even thought of that story was because I covered some lampshades during the intense couch sitting that was going on the week after New Years. It's a hard transition, that week after we get back from our holiday travels. It's like we just. can't. move. Even though I spend the entire trip home thinking about ALL THE THINGS I'M GOING TO DO AS SOON AS I GET HOME. Somewhere in between emptying the car, loading up the dining room table with miscellaneous bags of CDs, books, tools, gifts, and heaven knows what, and sitting down with that first glass of "we're finally home" wine, all that motivation f a d e s a w a y . . .
As I sat on the couch I noticed the pile of fabric and pillows sitting on the floor - the ones that I planned on turning into beautiful pillows for Christmas. In that pile was some white burlap. That white burlap inspired me. I had two lampshades in my living room that needed to be covered. They had been sitting around in their underwear for years now. And they were so ashamed. So I got out my scissors, pins, and a needle and thread, and covered those babies right up. I did this one first. I made this corbel lamp and the shape and scale of it has me a little bumfuzzled. There is something off about it, but I haven't figured out exactly what it is. The height is also a problem, so no matter what it looks like when you are standing, you can see right up under everything when you are sitting down. That makes it look like the shade is the wrong size. But I've tried five or six other sizes and they are not better. They are worse. So I finally just committed to this one. The other lamp is one I bought at an estate sale. I paid more for it than I usually do for lamps. But I needed a lamp that could put out some BRIGHT LIGHT. There is no ceiling lighting in the living room. I had been looking at new floor lamps for a long time. They were too expensive or too cheap and they only provided one 100 watt light or two 60 watt. This light holds three 60 watt bulbs on one switch and in the center there is a socket for a huge bulb - about the size of a softball - that is a 3-way bulb - 200, 300, 400 watts. It's great for my couch sitting crafts. 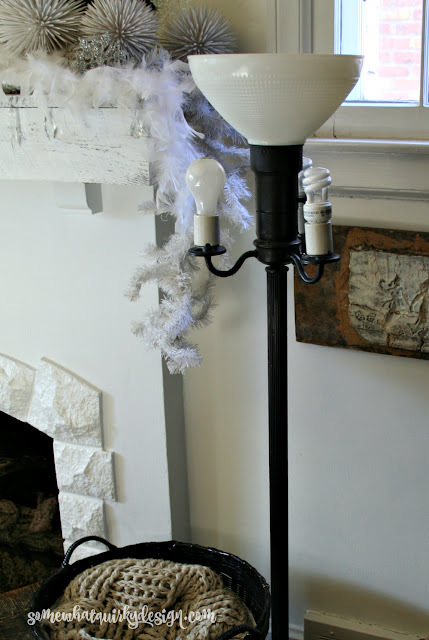 I did these the same way that I do most lamp shades. This link will take you to a full tutorial. 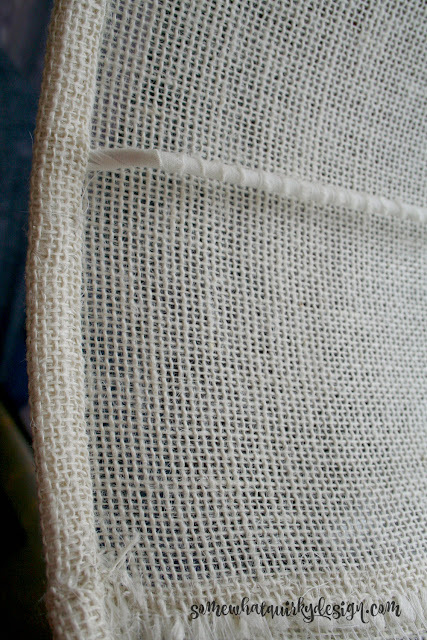 Burlap fabric has some characteristics that make it difficult to work with, and some characteristics that make it easier to work with. Since it is crisp it held the double fold really well. 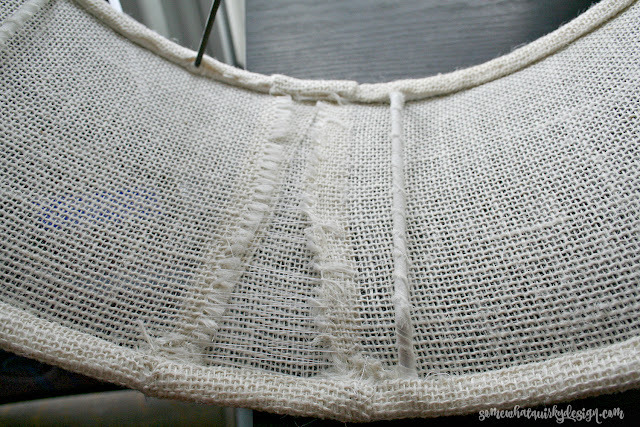 Since the weave is loose and bulky you can be a messy sewer (that's sew-er, as in a person who sews, not sewer as in where toilet water goes) and it doesn't really show. Those are the things that make it easier. The length of the cut of fabric I had was not quite long enough to go all the way around the shade so I had to add a piece of fabric to make it fit. To pull it tight and to ease the curve of the shade I took the inner seam fabric from those seams and sewed them up like a bustier. 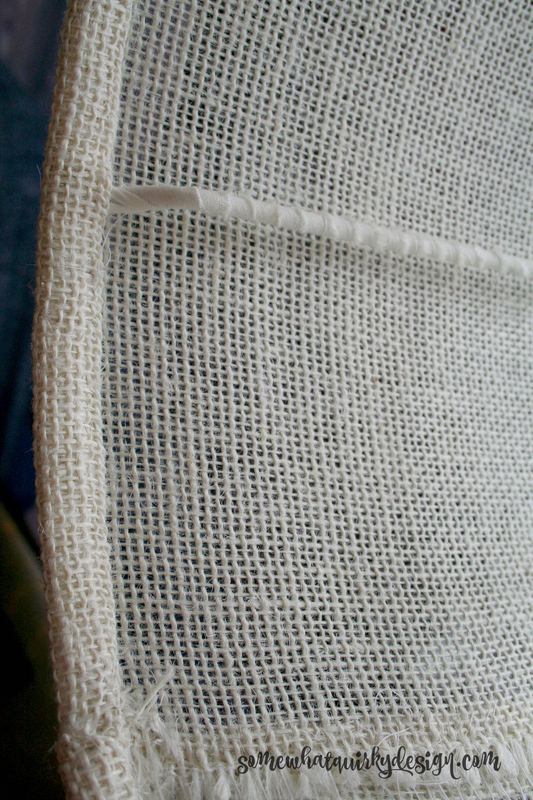 You have to be careful with the burlap and not pull too tight because it will come completely unwoven. From the outside this little fabric patch is amazingly unnoticeable. The larger shade has a wider patch. I did it the same way. I have been doing a little furniture painting as well and hopefully I will be able to show you some of that pretty soon. I've been trying to cut down on that couch time! Karen, I know EXACTLY what you're talking about with trying to figure out the bumfuzzledness, although your corbel lamp looks terrific from the photograph. My MBR lamps are similarly scaled, and my husband keeps complaining about how the light blinds him, and it's true - you look at the lamp from the bed and it's indecent exposure. I can't find the right size shade frames (and I don't want to spend a fortune). Your tutorial looks amazing, and I think I could accomplish that, but my creativity lately seems to be in moving furniture and numbers (taxes). What a tragic tale of your daughter's lamp. I'd still be having to work on the forgiveness and hopes for all good things for whoever took it. Regarding the lamp that you need to have as bright as possible, maybe you can consider using the new LED bulbs — not the swirly ones, but the ones that are shaped like incandescent bulbs. You can use really high output, because they use less electricity AND where you could only put a 100-watt bulb before, you can put in much higher ones, because the actual wattage is way, way below 100. Visit a store that has many options, and you might find something that could work now that couldn't have worked before. I am in love with that corbel. I need to find some architectural pieces. 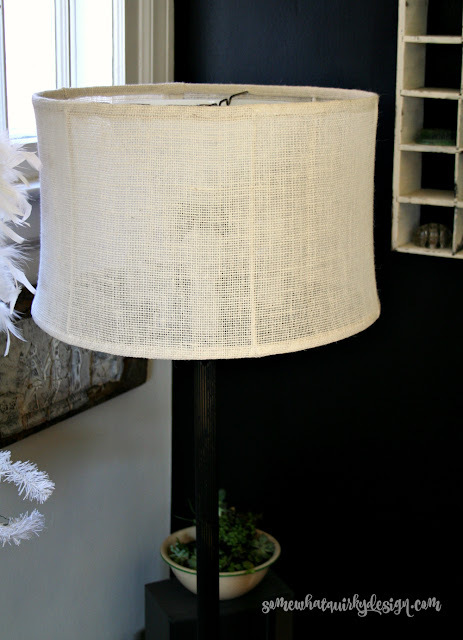 And, I need to give lampshades a try. It's crazy, you make lampshades. YOU MAKE LAMPSHADES, how awesome is that????? 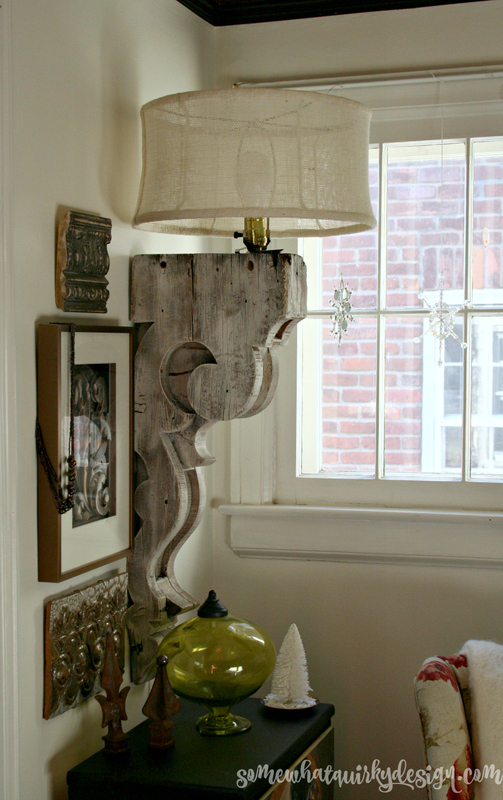 And the corbel lamp is totally cool. Oh Karen that corbel is stunning! Would you share the pattern as a printable? Thanks so much. Love your blog. 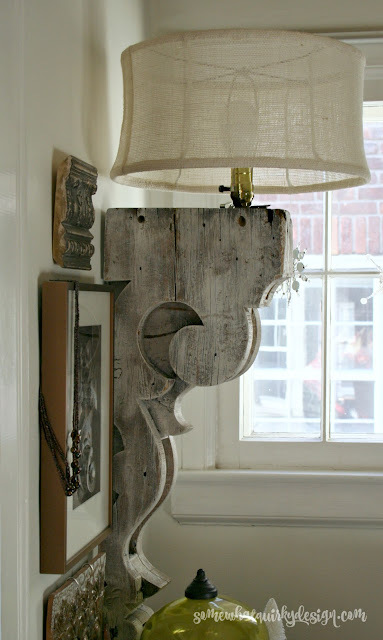 Your corbel lamp is the most amazing light fixture! Great job! Karen, I think they turned out fabulous! I actually love the uniqueness of the first light. You did an amazing job! Thanks for sharing with SYC. I'm sure it's not intentional, but I'm not seeing a link back to the party. That corbel lamp is stunning!! I utterly love it! I believe I've seen led bulbs where the light on the bottom portion was blocked. In other words the main light was directed upward, which would maybe solve your problem. Love the corbel.